I love Hitman: Blood Money. It's a game that gives you the freedom to come up with your own plan, it provides real satisfaction when your plan goes off without a hitch, and perhaps most importantly, it can turn into a mad, deliriously fun scramble when your plan completely falls apart. 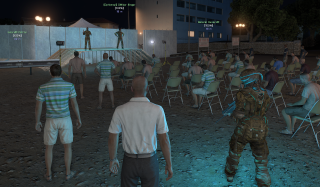 As Phil pointed out earlier, you can now relive some of that fun in this series of Hitman-inspired Arma 3 scenarios by modder Helios. There are a number of missions to choose from and many will feel immediately familiar to Hitman players. A father and son are hosting a gathering at a heavily guarded manor, and you've got to take both of them out separately. There's a opera being performed, and your target is one of the singers. A drug lord is throwing a party, and you're there to clip him, along with the guest of honor, if possible, while ducking members of his gang. Got my target, got my poison. What am I forgetting? Oh yeah. Dozens of witnesses. A lot of Agent 47's standard tricks are incorporated. You can steal people's clothing and wear it yourself, allowing you access to restricted areas, though the guards in the mod are pretty quick to sniff you out if walk too close to them, even disguised. You have a poison syringe you can use to quickly and quietly snuff one of your targets if you don't want to risk a shot with a silenced pistol. There are also things like weapons drops and uniform crates shown on your map, if you can manage to slip away and remain unnoticed until you reach them. And, of course, you can hide bodies. Just gonna borrow your clothes and bury you under the concrete if that's cool. Most importantly, these are freeform missions. Kill your target however you want, then escape to an extraction point. You start out in a safe area, usually filled with other, less-murderous guests, which gives you time to look around for your targets (they're marked by name on your screen), scope out the surrounding area and position of the guards, and find some way to slip away without causing too much suspicion. You may be able to switch off the power, giving you some additional stealth during night missions. Man. I see soooooo many different ways to fail this mission. As you can probably guess, blowing your cover doesn't quite lead to the madcap chases and fights you're used to in Hitman, because Arma 3 is much less forgiving in terms of bullets tearing into flesh. There won't be a long, frantic gunfight that slowly spins Agent 47 to the ground in slow motion. Get spotted and you'll get shot, get shot and your mission is most likely over right then and there. Dang it! I knew I shouldn't have disguised myself as a hitman. As difficult as they are, it's still a lot of fun to play these missions inside Arma 3, and they've been recreated very faithfully. Even as bad as I am at both Hitman and Arma 3, I did manage to take out my target in the opera mission and escape to the extraction zone, though it took more than a few tries. Best of all, you can play these missions co-op with a friend. You can subscribe individually to these missions on the Steam workshop, and you'll find them listed in the 'Scenarios' section when you launch the game.